Browse through our FAQs or speak to an in-house member of our team. Hostbot is a chatbot – a tool that automatically responds to your users queries and provides information 24/7 via messaging platforms. How do my customers interact with the chatbot? How will my bot enrich my customer’s lives? 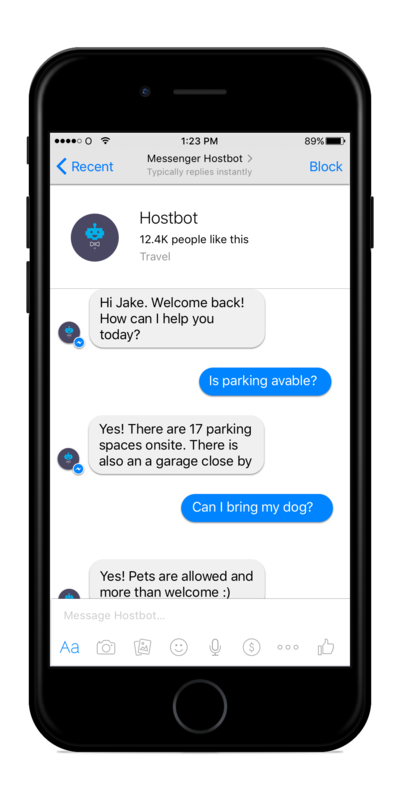 Chatbots can help your customers get 24/7 customer service, shop for new products, get breaking news and more. Do I need to have any technical knowledge to set up Hostbot? No. We make it easy by pre-loading most of the common data pertaining to your business. Updating this requires a few clicks and drags, or you can always ask us to do it! Am I tied into a contract with Hostbot? Not at all. You can cancel anytime. Where Will My Bot Live? For our basic packages, the bot lives in Facebook Messenger. However, we can add them to other platforms like Kik, Slack, Telegraph, iMessage, etc. We can also extend support to voice platforms like Alexa and Siri for custom solutions. Can my customers book rooms via the bot? Yes, with the advanced plans. We can integrate your booking system or add one for your. We can also integrate menus if you have an onsite restaurant.